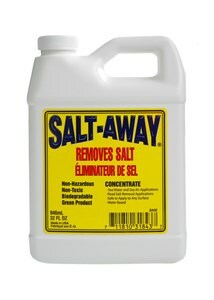 The Salt-Away 32 oz. (Quart) Concentrate can be mixed with up to 128 gallons of water. The standard ratio is 1 oz. to 4 gallons of water but concentration can be doubled for tougher applications. This container can be used to refill the mixing unit or you can premix in bulk if you prefer.